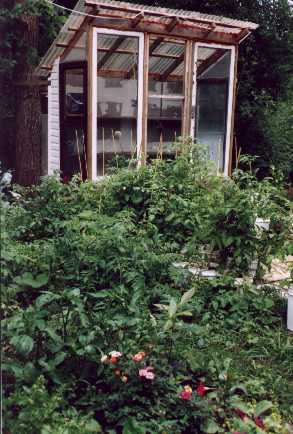 This is our own home little backdoor greenhouse. At one time, almost every home was a little farm. Everyone had a garden and a few chickens. It is a life-style now unknown to present city dwellers but still present to some degree with our village neighbors. It is a life-style to which many will probably return and the purpose of these pages is to help that transition. Library: Gathering Resources for After Doomsday. This web page deals with the technical aspects of farming such as seed saving, fertilizers, crop management and so forth. Other web pages in the hierarchy above this one deal with measuring radiation in food, alternate energy sources, and other subjects necessary to successful farming. This 42 page booklet was the US Department of Agriculture comprehensive attempt to prepare the farmer for nuclear attack. It contains much important information. This 14 page booklet is by the Canadian Government and has useful information about crop alternatives after a nuclear war, the handling of animals exposed to fallout, and many other items of information. Because farmers have to spend a long time in their fields and I am particularly concerned about the effects of UV (Ultra Violet - intense sunlight) after earth changes or changes in the upper atmosphere - I have done extensive study on this subject. This is an extension of the above subject and discusses UV measurement equipment and how to make it. The "Have-More" Plan (A Little Land - A Lot of Lving) by Ed and Carolyn Robinson is a 1940 classic devoted to the creation of a small farm. It is a bit dated in its view of DDT but generally may be exceptionally useful to those who are inexperienced and are trying to to start. 6 pages in .pdf format from Seeds of Diversity. Jean and I went down and took their course. This 200 page book - winnner of many awards is placed here through the kind permission the author Joseph Jenkins. It can be obtained in print at Jenkins Publishing, PO Box 607, Grove City, PA 16127. To order, phone: 1-800-639-4099. http://www.jenkinspublishing.com/ . Humanure: The Handbook available in .pdf format. This 12 page booklet gives information about wire fences, barbed, stranded, and electric. There are other kinds. This all ties into the food processing and preservation section where there is still more information. Goats are probably a lot easier to get started and maintain than cows, but milk is necessary from some source for many infants who won't survive otherwise. Chickens (or other poultry) are necessary for eggs and useful for food. Again, see the food processing and preservation section. Eggs are necessary for chickens. Here is how to build an incubator. You can see that chicken comes first on this web site - so now you know which comes first - and I really don't think that you would get an egg without a chicken. Rabbits are always considered an easy source to breed for meat. Easier than pigs or cattle. Being a vegetarian - this is not a big theme with me. My pet rabbit 'ran away' when I was a child. The chickens in the backyard did fare any better. The above about rabbits and worms made me realize that I hadn't put in a worm section, and Jean wouldn't be happy about that - so here is what she calls The Secret of Life. You will also need her paper on worms. And having not put in the worms made me realize I hadn't put in the bees. We have 22 hives and if you don't have bees - you aren't going to have pollenization for many plants. I have also left out a dog section. We volunteer to raise puppies for children with autism. Farming is fun. Anyway - the way we do it. The books below this level are copyrighted and will be made available by Ark Two (if we still exist and there is enough Internet to disseminate them) after Doomsday - when surely no one will object. The information here will indicate the types of information that you might be interested in gathering into your own library ahead of time. "Build Your Ark" (How to Prepare for Self-Reliance in Uncertain Times) by Geri Welzel Guidetti. Published by: The Ark Institute, P.O. Box 364, Monkton, MD 21111,email arkinst@concentric.net : This 248 page Book One on Food Self-Sufficiency covers basic concepts on gardening and goes into detail on soil improvement and insect control. Details are provided on a wide variety of garden vegetables. "The Farmstead Book 1" edited by Paul Harmond and is Published in the US by: Cloudburst Press of America, Inc. 2116 Wetern Avenue, Seattle, Washington 98121 and in Canada by: Cloudburst Pres Ltd., Mayne Island British Columbia V0N 2J0 - This 262 page Book covers soil and woods management on a more macro level than the book above and also covers the farm machine shop. "Grow Friuts & Vegetables The Way They Used To Taste" by John F. Adams published by Wynwood Press - New York, New York. This 104 page book deals somewhat with vegetables and seed saving but is more largely devoted to fruit trees. "Saving Seeds" (The Gardener's Guide to Growing and Storing Vegetable and Flower Seeds) by Marc Rogers and published by Storey Communications, Inc. Pownal, Vermont 05261. 97 pages. This web page deals with the technical aspects of farming such as seed saving, fertilizers, crop management and so forth. Other web pages, in the previous table of contents in the hierarchy above this one, deal with measuring radiation in food, alternate energy sources, and other subjects necessary to successful farming. Still other web pages deal with principles of machinery and old Pioneering skills. We may have to start up farming without access to all the present modern technology. We cannot just go back to the old ways. We have lost many of the skills. No one had them all then and you would be hard put today to find a wheelwright, a miller, a tanner, a barrel maker. All those trades, like farming have advanced into modern technology and the present experts seldom have used the old ways. Many of the old implements are no longer around and we certainly don't have the horses. Modern horses are neither bred nor conditioned to pull the plow. Still, in the skills of the past we may find solutions to the problems of the moment. It is important that you identify resources in your own area and store information that is applicable to the resources that you may have afterwards.